Microsoft Word, the world’s leading word processing program, offers a number of advanced tools for enhancing any complex, text-based document. 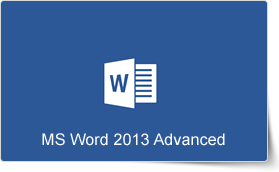 This Microsoft Word 2013 Advanced training course from PD Training covers the advanced functionality of Word 2013. After completing of this highly valuable course, you learn how to use the navigation pane, using various text effects, adding WordArt, inserting online media, record, run and edit macros and much more.